The guest bartender series at ~JARDINIÈRE~ continues this Wednesday with CBS’s Eye On The Bay host Liam Mayclem (or as I like to call him, Liam Mayhem Mayclem). 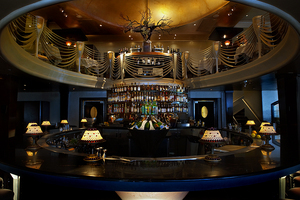 Liam will be serving the Pegu Club Cocktail from 7:30pm-9:30pm for $9. You can also get duck meatballs for the same price. And on Monday March 7th, there will be a riesling dinner, featuring Sofia Thanisch of Dr. H. Thanisch Erben Thanisch, with three courses and three wines for $45 (exclusive of tax and gratuity). 5pm-10pm. Read more about the dishes and pairings here. 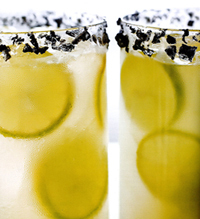 Margaritas; photo by Sara Remington. CUESA is partnering up with Scott Beattie, author of Artisanal Cocktails and the bartender at Healdsburg’s Spoonbar, for a series of six cocktail classes. All classes include a short “Cocktails 101” demo that will reveal how to properly shake and stir (and the reasons why you would do either), how to precisely measure, which ice to choose, glassware selection, and several other helpful tips that will insure better home bartending. The classes will be held in the CUESA Kitchen under the North Arcade of the Ferry Building from 2pm-4pm. The first class is The Amazing Local Spirits of St. George, with Lance Winters of St. George Spirits of Alameda on Saturday March 5th. Lance will be on hand to discuss all things spirit related, and Scott will guide the class through making Hemingway Daiquiris, an awesome whiskey/apple/ginger concoction with Thai coconut foam called John Chapman, and perfect margaritas. There will be many other St. George spirits on hand to taste and experiment with. So hit the market on Saturday, and then have a fun happy hour! $50, tickets here. 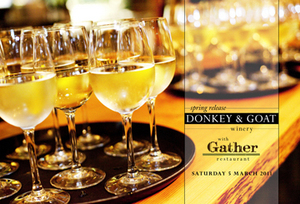 This Saturday March 5th is Donkey & Goat’s spring release party, and Gather Restaurant’s chef, Sean Baker, will be providing quite the lineup of tasty vittles. Here are the five wines and pairings: 2010 Grenache Rosé, Isabel’s Cuvée, Mendocino with fava leaf salad, grilled squid, charred onion vinaigrette, spring onion ash, and marinated fava beans; 2009 Brosseau Vineyard Chardonnay, Chalone with Mendocino nori-smoked kampachi crudo, avocado purée, corno di toro vinaigrette, mint, and green garlic; 2009 Four Thirteen, Red Wine Blend, El Dorado with Magruder Ranch wild boar trotter, belly, shaved head, smoked tomato beluga lentils, soft egg, and chicory; 2009 The Prospector Mourvèdre, El Dorado with seared chickpea panelle, spring onion butter, D&G Mourvèdre-braised wild mushrooms, San Joaquin Gold, and pine nut herb salsa; and 2008 Fenaughty Vineyard Syrah, El Dorado with D&G syrah-braised lamb shoulder, dried fava bean purée. $18 in advance (purchase here), or $25 at the door (cash only). Ticket includes a souvenir Riedel glass or save carbon, BYOG (glass) and save money with a $10 off voucher for any wine purchase of $35 or more. 12:30pm-4:30pm. 2323 B 4th St. at Bancroft, Berkeley, 510-868-9174. 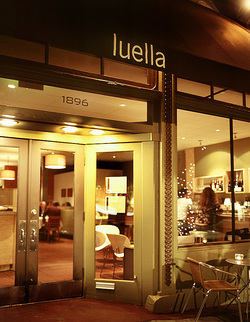 ~LUELLA~ on Russian Hill is celebrating their sixth birthday, and are celebrating by offering $4 wines by the glass Sunday through Thursday evenings for the entire month of March. Some examples of wines being offered are: Biohof Pratsch ‘Rotenpullen’ Gruner Veltliner, Austria, 2009; Dry Creek Chenin Blanc, Sonoma, California, 2009; Monte Lomas Malbec, Mendoza, Argentina, 2004; Borsao ‘Tres Picos’ Garnacha, Spain, 2008; and six other selections. 1896 Hyde St. at Green, 415-674-4343.